For one Montgomery County parish, serving crab cakes is a way of spreading the Gospel message. 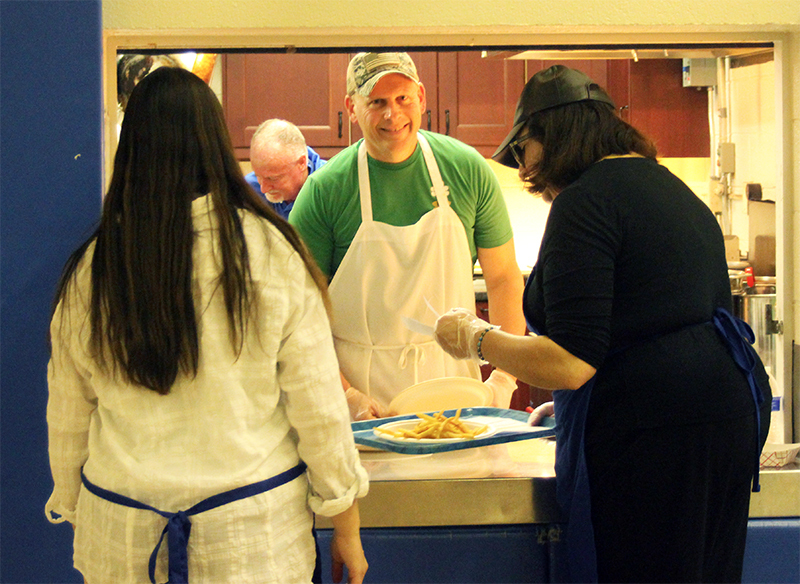 St. Mary’s in Schwenksville hosts an annual fish fry during five of the six Friday evenings of Lent, drawing hundreds of parishioners and community members. The shared meal “nourishes people physically, socially and spiritually,” according to Father Louis Bellopede, pastor. Now in its second decade, the gathering attracts an average of 250 diners per session and features both eat-in and take-out entrees. Selections include fried fish, meatless spaghetti, grilled cheese, mozzarella sticks, French fries, salad and cole slaw. A kids’ menu is available, along with homemade desserts (“if you’re not Lenting on those,” said Father Bellopede), coffee and tea. Weekly specials include baked salmon and the abovementioned crab cakes, while frequent buyer cards offer discounts on the meals. Some 30 volunteers work to transform the parish hall into a restaurant-like setting. 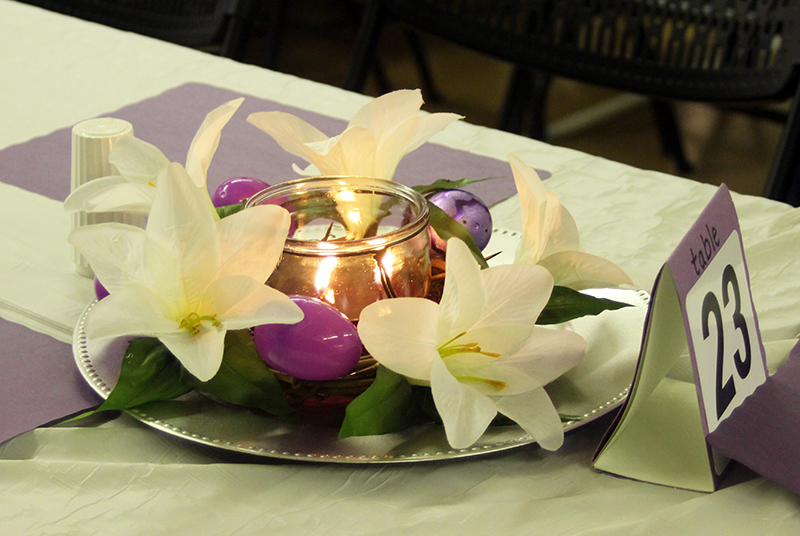 After placing their orders at the entrance, guests are seated by a hostess at tables decorated in Lenten purple. Servers bring appetizers and entrees, which are prepared by a team of parishioners in the hall’s kitchen. Soft music provides a soundtrack for the evening, which runs from 4 to 7 p.m. The relaxed atmosphere is the result of careful planning and a commitment to excellence, said Kevin O’Donnell, who coordinates the event. “We did a lot of research and talked to folks as far away as Colorado to learn different organizational techniques to make it more efficient, as well as more fun,” said O’Donnell. New volunteers, who are recruited each year, are trained “to serve the food in a way that is professional and respectful, and that keeps it hot,” he added. The same attention to detail is evident in the table settings, said O’Donnell’s wife Jeanne, who oversees the decorations. Placemats have Lenten images and texts, and the centerpieces, which she designs and crafts, underscore the reason for the season. Parishioners donate dinner items through SignUpGenius, an online software platform for coordinating volunteer projects. In addition, area vendors partner with the parish to provide wholesale pricing on dinner staples. For the volunteers, the weekly dinners are a labor of love. “It’s a lot of fun, and we’re just very privileged to be able to do this,” said Paul Brady, who prepared crab cakes and fries at the March 29 dinner. Originally from County Cavan, Ireland, Brady noted that the only ingredient missing from the parish kitchen was a bottle of malt vinegar, which is typically used to season fried fish and potatoes in his homeland. Although she was initially nervous about balancing trays of food, seventh-grader Audrey Wizimirski enjoys her role as a server. Such hospitality extends to diners from other denominations, making the event a form of ecumenism and evangelization. Fellow volunteer Mary Farrell added that “priests and members of neighboring parishes” also enjoy the fish fry. “We don’t have a fish fry in my parish, and my wife and son are at an event,” said Peter, whose daughter Bernadette declared the fish to be the best item on her plate at the March 29 dinner. The fish fry brings the parish and the wider community together in a simple but profound way, said Father Bellopede. The parish is a natural setting for such meals, he added. For more information on St. Mary Parish’s Lenten fish fry, visit CatholicPhilly.com’s calendar of events.